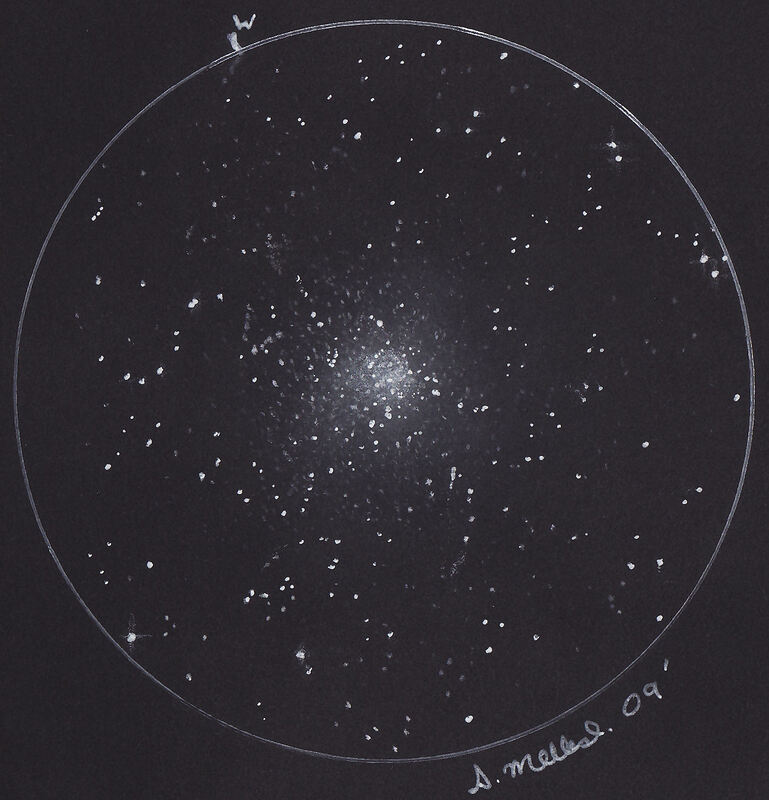 I have made numerous attempts at sketching this remarkable globular cluster over the years, mostly in small telescopes at low power where it is just a bright ball. At higher magnification in my 56cm dob it is a vastly different object. I had a dose of the Flu while I was away observing, but the sky was clear so I spent a solid two hours at the eyepiece sketching this globular, and it nearly done my head in. Every time I looked in the 8mm Ethos there seemed to be more and more stars to add, plus the 100deg FOV of this eyepiece was almost to much to handle. The following night was clear again so I spent another 40mins just dabbling with the sketch to try and get as accurate eyepiece view as possible. I have never been 100% satisfied with the sketches I have done previously of NGC 104 and most made the bin. This one however came out fairly good, it is certainly the best I could do with 47 Tuc. I do not like to overdo eyepiece sketches, especially with size and brightness as one can be tempted to get a bit carried away, and detract from the visual perspective. There has been no processing done with the sketch. I do not think I will be doing NGC 104 again any time soon. Looks great your efforts paid high dividends. An amazing achievement: such a rich cluster in such a rich starfield. Fantastic job! You may be proud on this drawing. Thank you, Most of the outyling stars are actually members of the cluster. There are also a number of other stars belonging to 47 Tuc that spill out beyond the 17′ field of the sketch.